3D models of all your favourite items can now be yours for the asking. Want a custom made wooden chess set with models of your family as the pieces on the board? Forget the King and Queen and all the little pawns. How about Dad and Mum and all the kiddliwinks! Bring the item you want scanned to us or we can come to you. Natalie is here holding a 3D routing of a family friend. Pete scanned the friend and stitched together a 3D model. 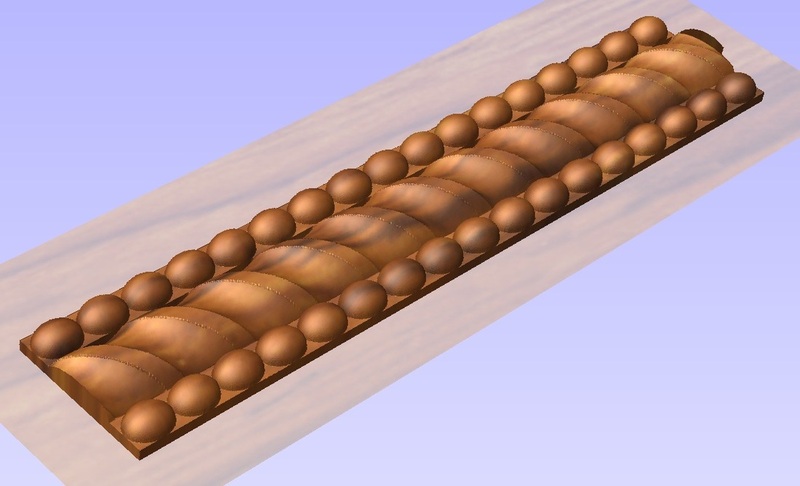 Sent a tool-path of the model to the CNC router and voila! The possibilities are endless. Imagine a chess set - instead of kings, queens and pawns you could have images of the members of your family. You could put the faces of your children as capitals on either side of your gate! Find it hard to buy presents for Grandma? 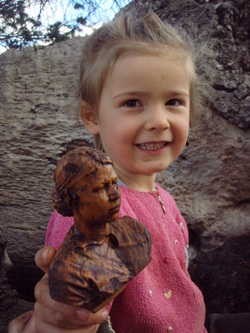 What about a figurine of a grandchild? Custom signwriting has a beautiful sharp edge with the CNC router. Font, size, wording - all as you want it. 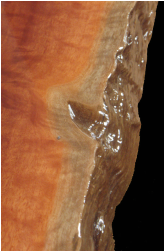 There is nothing quite like natural edges. A customer brought in a huge redgum slab and Pete turned it into a dining table by strengthening the slab, filling the holes, creating a redgum frame and polishing. We also have some unique timbers and logs in our log yard and are happy to turn your timber or ours into the furniture you desire. 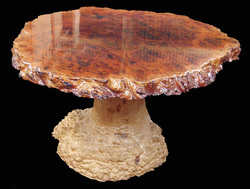 Here is a coffee table with a beautiful redgum burl top. So unique. Pete has done a crisp polishing finish - very fine. 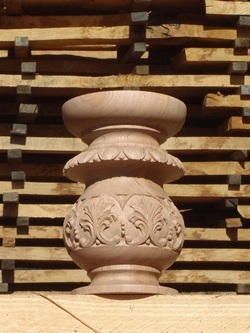 Pete handcarved this for the top of a pedestal, but it is just the sort of job which the five-axis CNC router can tackle. Either way, a beautiful item. 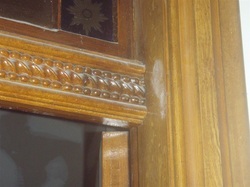 Here is a photograph of a moulding in a beautiful old Heritage home. 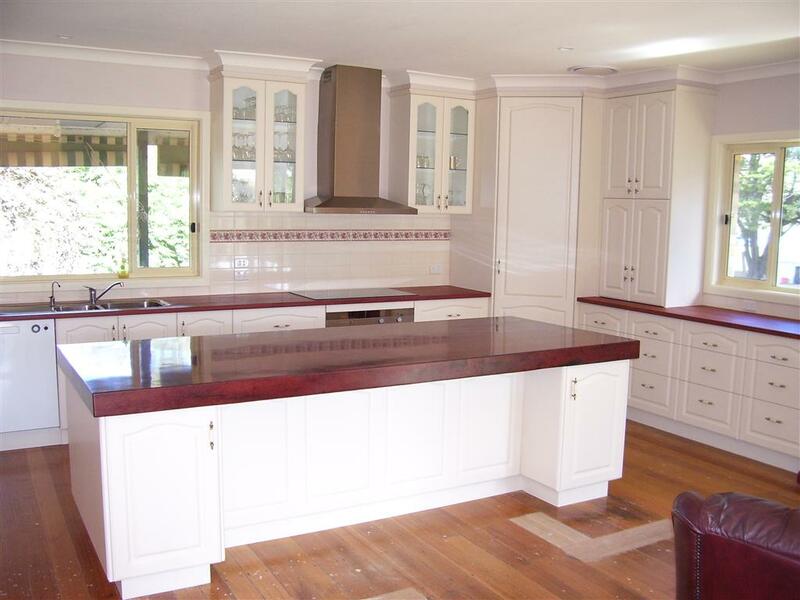 The owners wanted to reproduce this feature in other parts of the home. 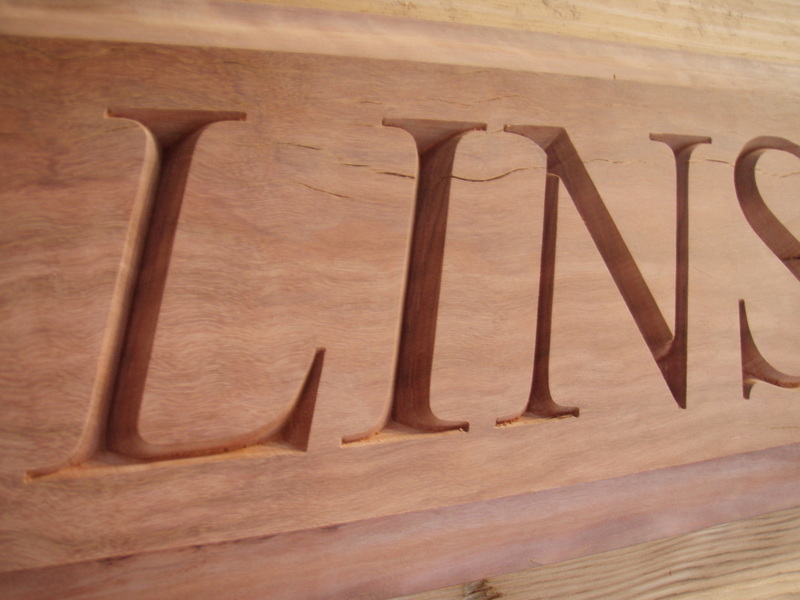 With the creation of a 3D model our CNC router was able to tackle the job. Our CNC router has arrived! Some of you may have seen our DVD promo "Coming Soon to PD Woodcraft" in which we advertised our intention to acquire a laser scanner and CNC router. We are so pleased to announce that the CNC router has now arrived from the USA! This is a big step for PD Woodcraft and we hope will translate into shorter lead times and more family friendly working hours. We do not have a laser scanner yet. Until we acquire ours, discuss with Pete how we might be able to create a 3D image of your item for the CNC router merely from a few photos. 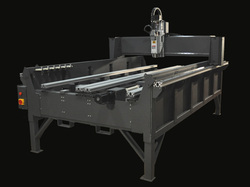 For more information on the CNC router click here. 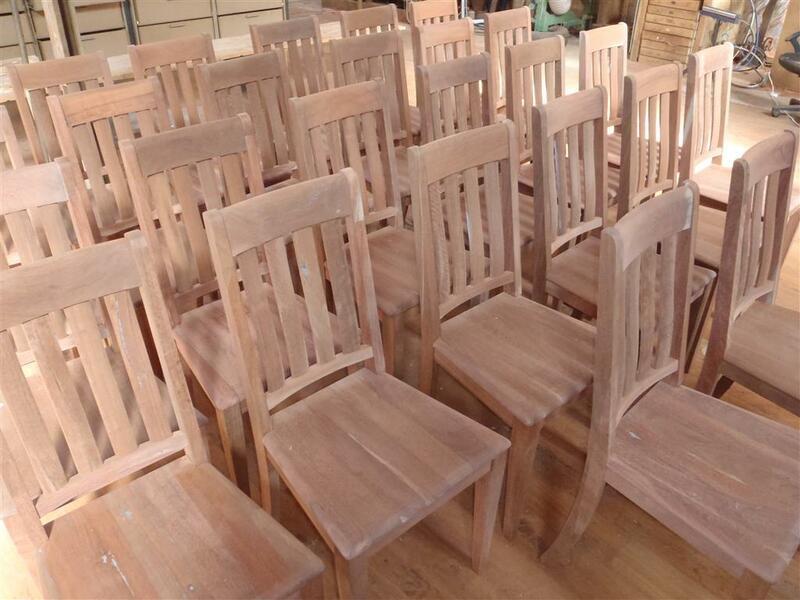 Our latest order for Mollison chairs is ready to leave the workshop. These are unpolished - as requested by the customer - and we are also able to supply polished chairs. Although these have a plain seat we are also able to supply chairs with a saddled seat or upholstered in calico (ready for a final cover from your upholsterer). The chairs were made from jarrah - an excellent choice. 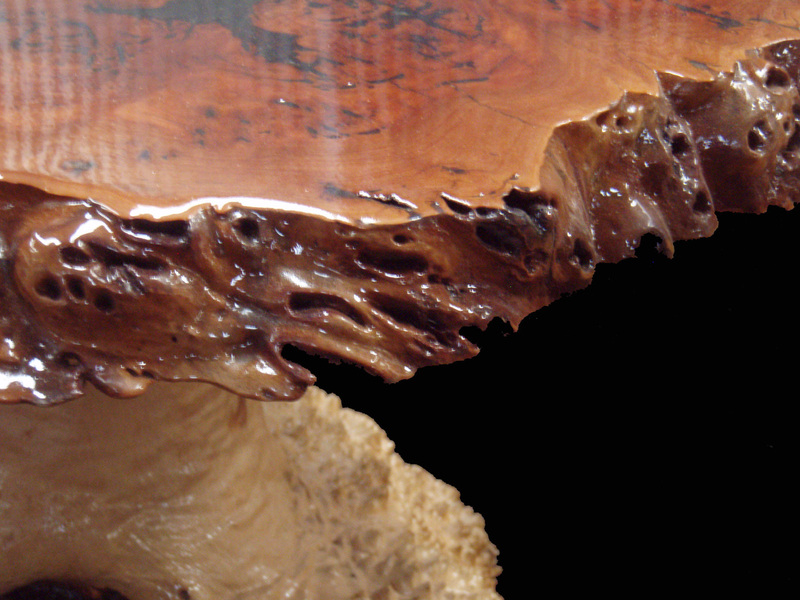 We are also able to make them from iron bark, redgum, elm, oak - you name it! A customer brought us a HUGE rough sawn redgum slab with natural edges. Pete cut it to size, filled all the holes and two-pack polished it to a smooth shiny finish. The top of the island in the picture below is the result! There will be a lot of history and many years contained in the piece of wood used in the top. Beautiful.